I saw a news article today addressing a problem with a lake in Alberta containing carcinogens. Local residents are not going to bathe or drink using the water from said lake, until such time as they can figure out what is causing the water to become cancerous. I think that the solution would be to remove the carp from the lake. Sometimes, I wonder what isn’t cancerous these days. It seems like everything is. Why, even this blog entry is causing someone cancer somewhere. What a strange phenomenon cancer is. Cells go wrong and eventually kill us. A coup d’etat on our life from within our own bodies. Don’t be fooled by my tone here. Cancer has affected folks in my life that I care about. Indeed, it’s not really all that funny. But at the same time, there is something cathartic about thinking of it as an entity and then making fun of it. Not everything today will be grim. I get asked every once in a while about the cats that are in my photo album on my blog. Today I will tell you the story of these felines. Anyone who owns pets knows how these furry (and sometimes not furry*) creatures can burrow their way into your heart (especially moles). Our own fuzz balls, Laila and Logan, were retrieved from an animal shelter near our place. However, I always wanted a cat. And so, at the beginning of the millennium, I was on my own. You’ve never had one before. How do you know what to do? One day you’ll run out of groceries and the stores will be closed, and when you look at your cats, all you’ll see is a steaming platter of meat! Discouraged, I figured I would wait until I moved in with Mrs. J to get pets. She wanted pets, too, but was afraid of the responsibility. Bummed out, one day I had to renew my parking pass for street parking, and so went to the place that did that sort of thing. I found out through casual conversation with the lady behind the counter that there was an animal shelter not more than fifty metres from where I was standing. There was a marvellous black cat there who came right up and rubbed her face on my hands. One of the workers commented how this cat hated people, and how this was the first time she’d shown anyone affection (she was abused as a kitten). I would visit every so often, bringing old blankets and small toys for them to play with. The more time I spent there, the more I wanted cats. But I needed a strategy. Rather than put up with my crap, Mrs. J relented and we agreed to get two cats. She wanted to get older ones as they would already be comfortable with each other. Unfortunately, when we arrived at the shelter, all of the adults cats that we saw were there were on their own. There were, however, a few pairs of kittens (One of these little fellas sounded like Edward G. Robinson. Meah! Meah! For those who don’t know who that is, think of Chief Wiggum from The Simpsons saying Where’s the messiah now, Flanders? Meah!). Two of the kittens caught my eye right away. We were told that the pair of furry kittens were not related, but they seemed to get along. They were three months old. The best thing about them was their personality. When Mrs. J and I would stand by their cage together, they would sit straight, looking at us like cute statues, tails swishing slightly back and forth. However, when Mrs. J turned around to look at other cats they would start running around acting crazy, climbing the cage and just going nuts. I knew these were the two for us. We took them home and named them Fred and Wilma. They didn’t respond well to this, so we renamed them Laila and Logan. Okay, well maybe not the raven, but me. Stress is the refuge of the fearful. I searched on the internet and I couldn’t find it anywhere, so I must be the first one to use it! I asked Dave about this quote, and whether he thinks it might catch on. He said that he’s never heard it either, but that I can’t just promote my own quote. Someone actually has to quote me. Feel free to use this. Maybe I will become famous! Enjoy this new useful piece of information! Kittens are indeed wonderful things. When I first moved to Ottawa, we got two little kittens who slept all day and starting around 3 a.m. began to run at each other down the railway hall of my 2nd story apartment. They would meet in the air, around the middle of the hall, just above my landlord’s bedroom, rolling, bumping and screeching, and keep it up until about 6, when they would sleep all day and…. Maybe I’ll use your quote on my page to make you feel better. 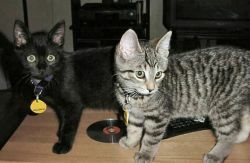 Your cat story reminds me of the two cats I got years ago. I only intended to buy the girl that was in the cage… the guy I was dating at the time was in love with her. As he was cuddling her, I felt bad for the other cat and picked him up to give him some attention. He looked me in the face with absolute love, then stretched his front legs out against my shoulders and layed his head on my chest and went fast asleep. I felt like he had picked me. They said that they weren’t brother and sister, but he was the only cat she got along with. I bought both… Dominic & Fiona. Dominic was hands down my favorite pet that I’ve ever had. Unfortunatly, last year he developed a blood clot in his spine that paralyzed him & I had to euthanize him, which is getting me teary just thinking about. All along though, he always made me feel like he had picked me. Fiona, always the ball buster has moved on to busting Rocco’s balls now. I’ve had all kinds of pets too, my dad’s a vet so I guess that’s only natural. The turtle smelled terrible, the snails would go from one to 2,000 somehow, my fish always die too, except the ones I never liked, and they live forever. I had gerbils once too. One got attacked by Fiona the ball buster and was crippled after that. Somehow he still managed to eat the other gerbil. And you know… I heard that teflon is a carcinogen too and that 90% of us already have it in our blood. haha… cute story with the cats. i like cats too… maybe kittens only, but they give me allergies. 😦 i can’t even pet molly (court’s dog) anymore. cool quote, i’ll tell my boss. the employees i replaced (3 people), all took 4 week “stress” leaves before they were fired. Man, you were really “on” when you wrote this. If I could vote, I would choose this post as best ever. Sooo funny in many places. Funnier still, Jason is using those very same tactics for getting a cat. As a kid, we had many animals, no snails, but frogs, turtles, fish, a budgie, rabbits, and a dog. Jason always had cats. We never had cats. My mother is deathly afraid of cats. If I got a cat, she would never come visit again. I think this is why Jason so badly wants a cat. But some of my mother’s fears have rubbed off on me, and I find myself uncomfortable with cats. Still, if he keeps purring, I’ll either give in or club him someday soon. I’m taking bets. Which would you put your money on? I know somebody in ALberta..would it be mean of me to hope they take a loooong dip in that tainted lake? LOL j/k Have a good weekend. I wonder if it would be better if it said… “Stress is a refuge for the fearful?” That would make more sense. Patresa, You must be from the US if you think you can sue me for that. 😉 Listen, I don’t see how you can take legal action if I call Cancer a jackass? Who likes cancer, anyway? Funny, my Levi doesn’t really seem happy to have the other cats around. He just tolerates them. I’m amazed that Patresa’s Ebu likes having new kitties around. Great kat story. Levi is from the pound. Cassius was brought down as a stray from the mountains and Miss J just sorta wandered into our lives.